ICE MICE is designed to help preschool-age children develop the preliminary coordination and strength necessary to maneuver on skates. By the end of this program, skaters should feel comfortable being on skates, and be prepared to move on to Learn to Skate, Learn to Skate for Hockey Players or Hockey Development. There are no make-ups due to Ridgefield school snow day cancellations. Knee pads, elbow pads, hockey helmet with face mask & gloves required! Winter Garden has skates & Hockey helmets for participants to use each class. We recommend that you purchase your own elbow & knee pads. The Pro Shop has all the equipment your need to get started and answer any questions about the equipment you may have. Fall Term - 10 WEEK SESSION! Winter Term 1- 10 WEEK SESSION! Winter Term 2- 10 WEEK SESSION! Winter Garden Ice Arena reserves the right to cancel or combine class time due to lack of registrations. Our 3-5 year old Ice Mice classes in action! Winter Garden now offers a learn to skate program specifically designed for the future hockey player. 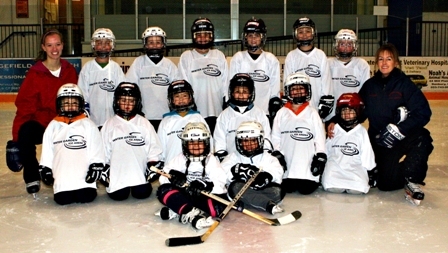 Based on USA Hockey's Learn to Skate Program with elements of the USFSA Hockey Skating program , Hockey Learn to Skate will prepare your child to move into the Hockey Development Program with a firm hockey skating foundation. The program, held on Saturday mornings, will divide skaters into small groups based on ability, and will feature 50 minutes of instruction. Hockey helmet with face mask, elbow pads, knee pads and hockey gloves are required equipment. Winter Garden has complete sets of hockey equipment as well as skates and hockey helmets that children can use for each class.This program is ideal for the complete beginner as well as older Ice Mice graduate. Space is limited.